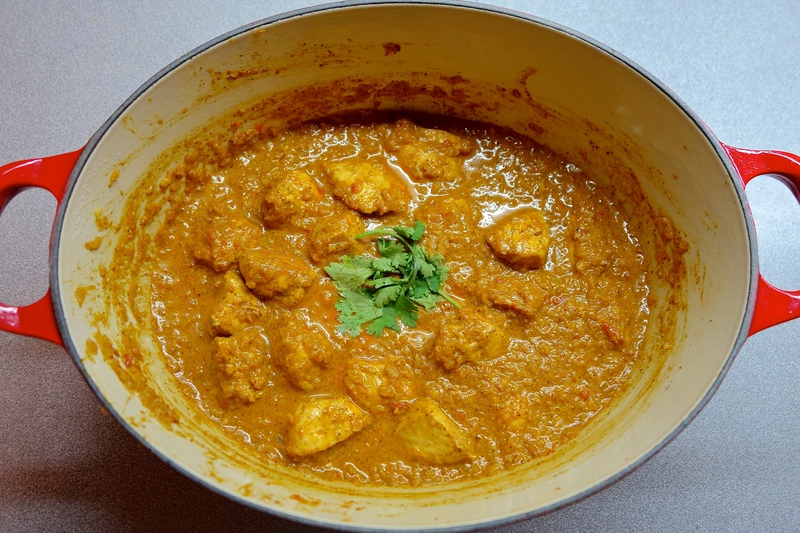 It’s not so much a complicated recipe that scares me from trying Indian curries – the recipes are actually quite easy and once you have those few key spices in your pantry, there’s not even that much that you need to buy from the supermarket. No, it is the fact that I might screw it up that worries me the most – that I’ll spend an hour pounding garlic and ginger into a paste, marinating meats and stirring away at a sauce that is never going to come off my dress if it splashes, only to have a steaming mess of an end product that I can’t serve. Thank goodness for that decent Thai takeout down the road! It gave me the confidence to try out this recipe without worrying that PB and I will starve for the evening. I have been wanting to make a dent in the Indian spice collection that I acquired when I was in New Delhi last year. I went a bit mental in the shop and PB had to stop me from buying every product in the place. Then I promptly stuck it all in the kitchen cupboard when I got home and forgot about them. One of the spice mixes I bought was for butter chicken masala. The spice vendor gave me a recipe that required a couple of quite challenging steps (making your own yoghurt, cooking in a tandoor oven…), so I adapted it into a easy to make recipe that can be done in an hour after work. I made it together with Brown Rice Vegetable Pilau, and they go down a treat together. 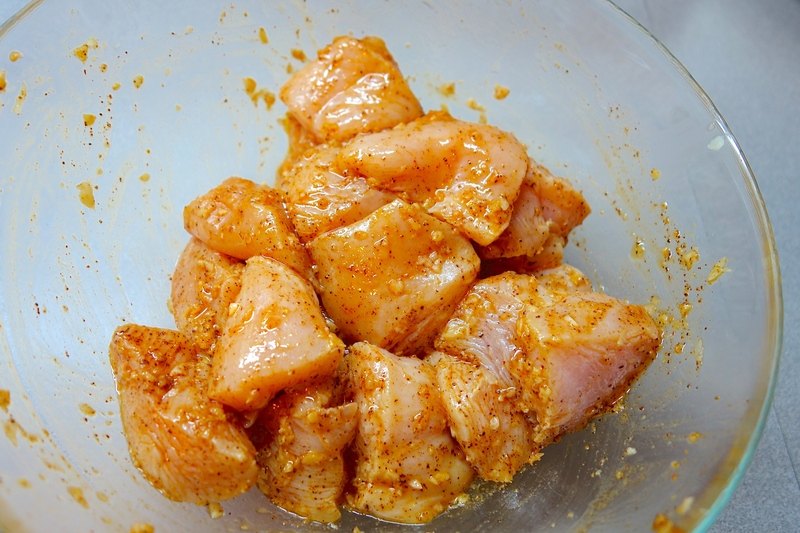 ♥ Marinate the chicken for 3-4 hours if possible. If not, just for 1/2 hour while you prepare the rest of the ingredients. ♥ Heat the butter in a pan and add the minced onions. Fry until golden brown. ♥ Add the ginger, garlic, coriander, chilli powder, turmeric, and salt. Fry for a minute until fragrant. 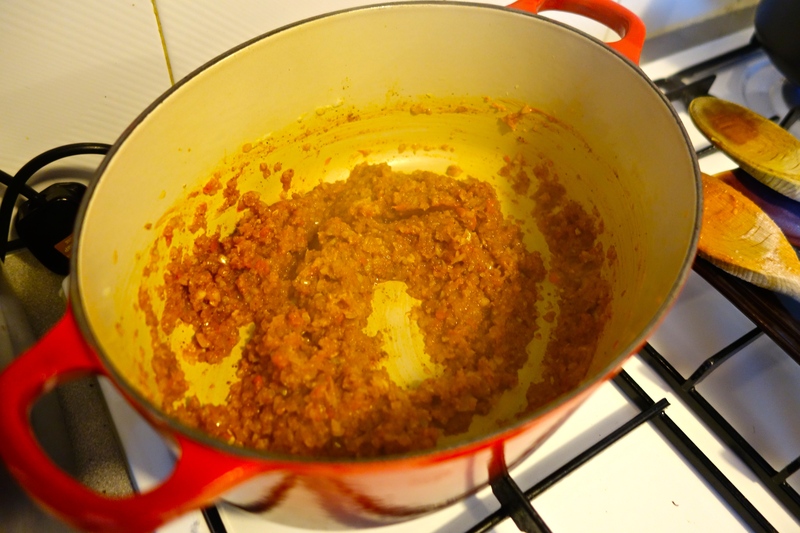 ♥ Add the pureed tomato and tomato paste and cook for 3-4 mins until the mixture bubbles. ♥ If you would like to sear the chicken before you put it in the gravy, now’s the time to do it! Heat a pan to high heat to sear the outside of the chicken then quickly set aside. ♥ Add milk and the cubed chicken. Cook covered for 8-10 mins over low heat until the chicken is soft. Stir once or twice to ensure it doesn’t burn on the bottom. 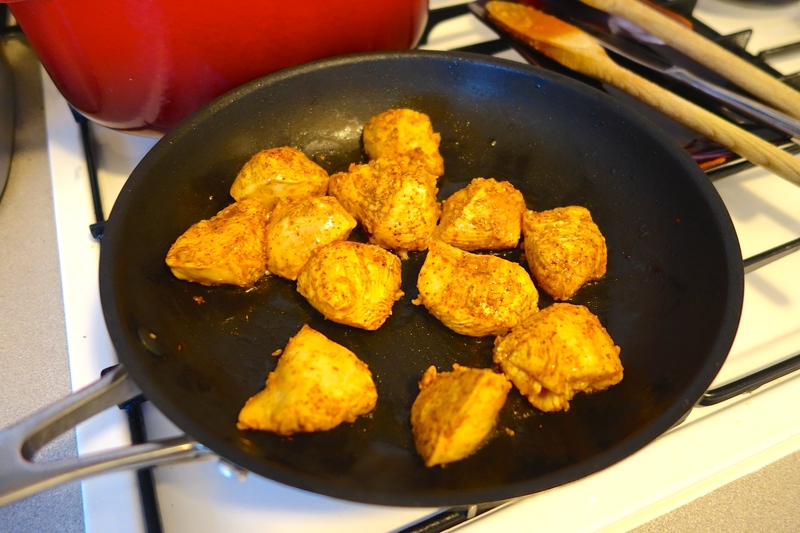 ♥ When the chicken is cooked soft, open the lid and cook for a further minute or two. Remove the chicken from the pan to avoid over-cooking. If the gravy is too thick, add some water at this stage. If it is too thin, cook it down further to reduce. ♥ When done, add the garam masala or chicken masala and the cream or cashew paste. Give it a good stir, but don’t boil. ♥ Adjust as needed, garnish with the coriander leaves, and remove from fire. And there you have it, a homemade curry that you can call your own! It is not like the authentic ones you find in restaurants. This is a lighter, healthier, pared-down version. One day when I have more time, I’ll try the recipe from the spice vendor, but until day I have a tandoor oven (or at the very least a BBQ! ), this will do for a quick after-work fix! – I always find breast a bit dry, and very easy to over-cook. Try a combination of thigh and breast. – Garam masala powder is typically added at the end of the cooking process to preserve the aroma and fast of the spices. You can use garam masala powder at any point in the cooking process, but adding a sprinkle at the end of the recipe will heighten the flavours of the dish. -If you too are scared about screwing up your curry, I found these great tips of what to do when good curries go bad!